If you follow me on Twitter, you might already know that I've been quite obsessed with buying new lipsticks, both low-end and high-end. Today I thought I'd show some lippie love and share my recent lipstick purchases from Priceline when they had their 40% off all cosmetics promotion. I decided to pick up two Rimmel lipsticks from the Kate Moss range. I love the sleek matte black casing on the lipsticks as well as the 'Kate' signature with the heart as it reminds me of MAC limited edition lipsticks. Rimmel's crown logo is imprinted at the top of the lid to add some extra classiness. Apologies for the graininess/noisiness of the picture! I remember the first lipstick I ever purchased being a Rimmel one so the scent of their lipsticks always bring back memories. These retail for $11.95 each so by grabbing two when they were 40% off, I only spent $14.34! I decided on a pink shade and a red/coral shade as from memory these were the shades missing from my collection. 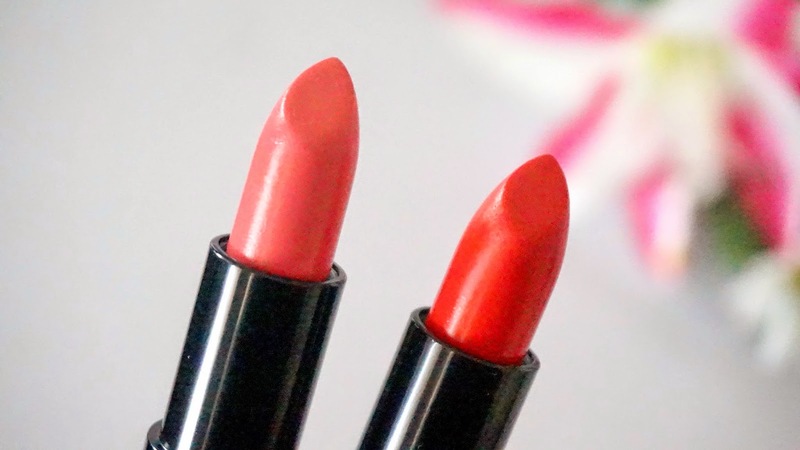 Rimmel lipsticks' quality has been compared to MAC's cremesheen lipsticks which are pigmented and glide on smoothly across the lips. I definitely can see how they can be compared as the Rimmel ones do have that creamy texture but MAC creamsheen lipsticks are more creamy and more long-lasting. I also find that MAC lipsticks have a slightly better colour payoff as well. From the sticker and the swatch, it looked like perfect light coral pink to add to my collection so I was really excited to finally have a nice coral shade. This one smelt different to the typical Rimmel lipsticks as it had a more citrus-like scent. In fact I found this scent to be a little more pleasant than the standard bubblegum-like Rimmel lipstick scent. I have to be honest here, I was completely disappointed with the way it looked on my lips :( This was not the shade that I was after so I feel really misled from the sticker at the bottom of the tube and the swatch at the back of my hand! Also I don't think I can pull off a pink like this that has a blue/cool undertone when my skin has warm undertones. I'll probably be mixing this with other lipstick colours if I ever plan to wear it out. Such a shame! I find colours like these make me look a bit off and accentuates any cracks/flakiness. 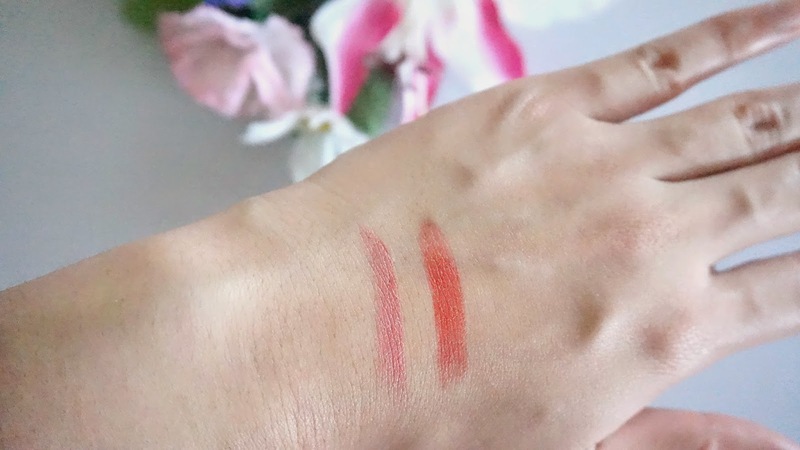 Now this is the perfect coral red shade and it was love at first swatch! 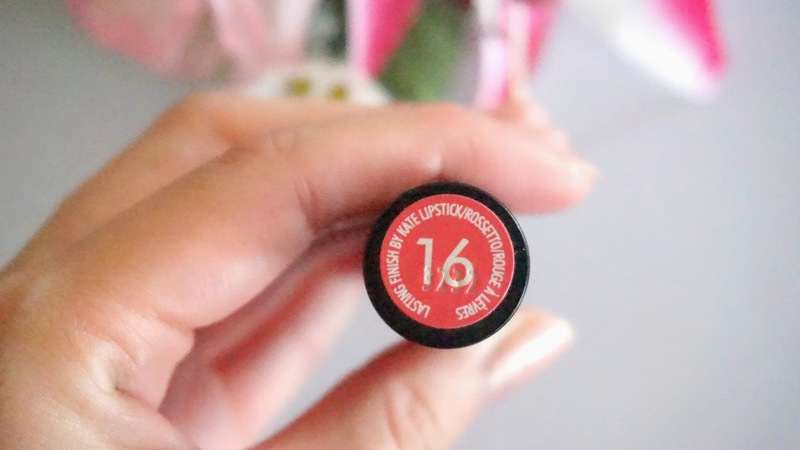 A lovely colour for people who have warm skin tones like myself and still want to be able to pull off a red lippie. The great thing is that this shade is also suitable for people with cool skin tones. This is definitely my favourite out of the two, not only because of its shade but also because it matches the sticker and swatch perfectly! Such a gorgeous colour for everyday wear. It applied on very smoothly and gave a nice glossy finish that felt comfortable and moisturising and didn't dry out my lips at all. It faded evenly on my lips after a good 5 or so hours of wear without needing any touch-ups. Generally I do prefer more high-end lipsticks that have better lasting power however these Rimmel lipsticks are great for experimenting with new shades without having to fork out so much. I do think that these last longer than a number of low-end/drugstore lipsticks as I could still see the colour after eating and patting my lips with a tissue. I do think that they give a lasting finish like the name says so these lipsticks get my tick of approval. However it would be nice if all of the Rimmel lipsticks had names just to make it easier to refer to, as numbers can be difficult to remember. While considering both ends of the spectrum of pink and red shades, I think I suit reds more than pinks and I find red a little more easy to wear - plus who doesn't love a classy red lip?! Love both though! Disclaimer: This is not a sponsored post, nor am I affiliated with any of the companies mentioned in this post. Products were purchased with my own money. All opinions are stated by me and are 100% honest and free from bias. See more at http://www.questjen.com/p/disclaimer.html for full disclaimer.